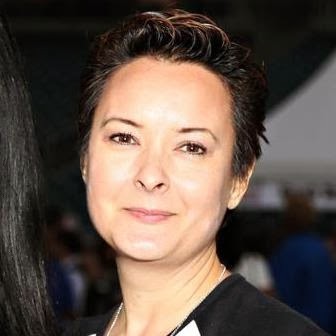 You may have read my bio and know that I grew up in Saudi Arabia for all my school age years. My dad was there for 16 years and during our vacations back in the States we would often get the (stupid) question - Do you ride to school on a camel? Suffice it to say, I never rode a camel. I saw plenty of them, of course. 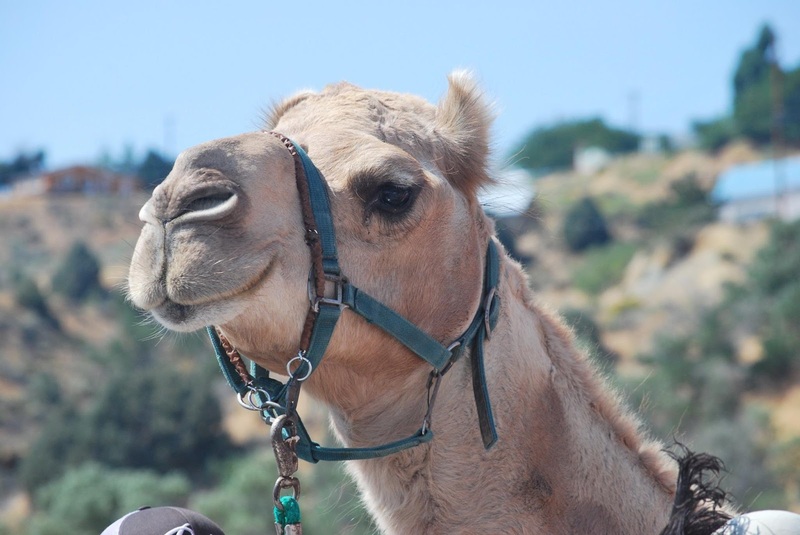 I even was given freshly milked camel's milk by a bedouin in the middle of the desert, but I never rode a camel. That is, until last week. Not only did I ride a camel, but I raced one. 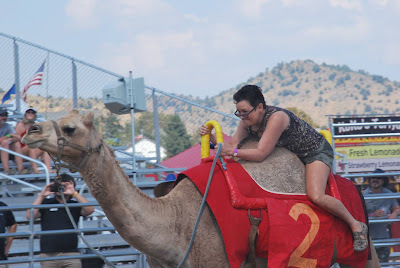 Every September for the last 58 years Virginia City has hosted camel races. Not just camels, either. 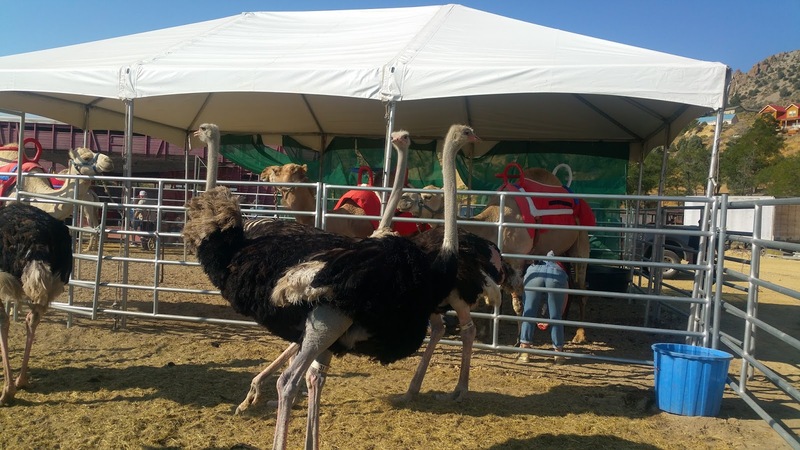 They also race ostriches and zebras. This traditional, fun, family weekend has been one of the staples of Virginia City's tourism calendar. Lucky for me, Fridays are devoted to media, who are invited to ride. This is my third posting of Virginia City on my blog, but in the upcoming November issue of Sacramento Magazine you should find a piece I wrote about it as a great getaway weekend for adults and for families. I arrived Friday morning to find a dozen camels, four zebra, and about ten ostriches and a handful of emus. All of these exotic animals come from Hedrick's Promotions, Inc. based out of Kansas. Joe Hedrick has a history in rodeo and with dealing with exotic animals. Over the decades he has amassed about 70 camels, 50 ostriches, and more on his Kansas ranch. I'm assured by the the Virginia City Chamber members who have visited his ranch that the animals live a very good life there, with plenty of open acreage to wander about. We were given an orientation about what to expect, sign waivers, etc. 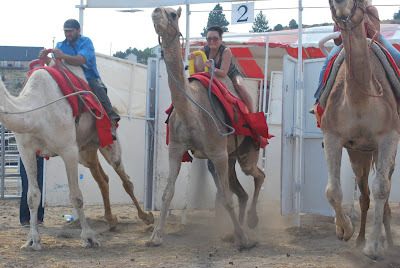 Then we got to ride a camel around the ring to see what it was like when they were just walking. Very bumpy. While we waited we got to hang out behind the scenes. 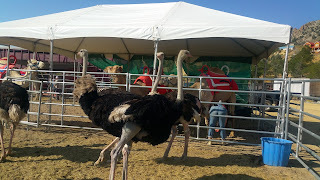 The ostriches, like the camels, are very tall. I definitely was having to look up at these crazy birds. At one point I had my back to them and my elbow resting on the bars of the enclosure and next thing I know, I got bitten! Others have fared worse, I hear, with bruises and hurtful nips. For me it was like someone with a set of plastic, duck bills on their hand that clapped onto my arm. Shocking at most. Finally it was our turn for the last race of the day. It was quite difficult for me to climb up as there was no ladder and I'm only 5'3". I was finally on board and then was shocked to get a soaking! I thought the camel was somehow peeing on me! But how can a camel pee up and cool? Turns out a gust of wind came just at that moment and blew water off the awning behind me. At virtually the same moment the gates were open and we were off! All I cared about was hanging on and I think you can see that in my expression. I asked a woman in the audience to film me, so that's why the poor quality of my video. Thank goodness Daniel from Visit Virginia City got the great still shots! 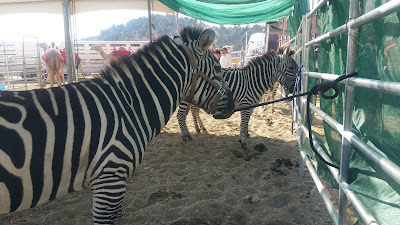 If I continue to go back each year there's a chance I can graduate to zebra or ostrich! So why not? Check out the Virginia City calendar. There's always something fun going on. Next month: Outhouse Races! 13 Ways to Identify a Dating Scammer.